the intersection of narrative and image-making. 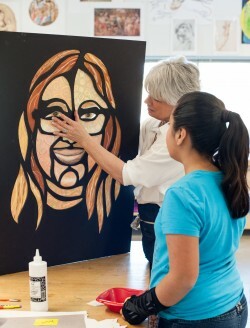 In collaboration with Todos Juntos and Baker Prairie Middle School, a select group of students meet twice weekly for 8-10 weeks, exploring artistic concepts and the roles of individuals in their communities.The youth work with a professional artist using interviews and visual art to develop new skills and tell the stories of their community, helping them to create connections and understand the importance of participation. The project concludes with a public installation, along with the opportunity to present their work and their accomplishments. I have more confidence in myself now. I feel like I have changed a little bit, in how nervous I used to be about asking people questions. I’m not as much anymore. I liked meeting new people and being able to experience seeing other people’s stories and how they lived their lives. I liked learning something new that I didn’t know before, and working with people I don’t know and seeing how we work together as a team. I overcame being shy and asking people things and interviewing. That’s a big help. It was a really fun experience and I hope I get to do it again in the future. I liked the quality of the project and the interaction between students and adult mentors. The students were excited & proud of their work! I thought it was so intricately designed and beautiful. I love the maps and red string and all the photos. I loved the photography and learning about people that I recognize from the community. I loved this whole experience. My daughter has loved this experience. She was such a shy and quiet child, afraid to talk in front of people. She now has found a love for it.